WASHINGTON – A White House plan to give a path to citizenship for 1.8 million immigrants in exchange for a border wall and tougher immigration policies was attacked from all sides Friday, called racist by one side and a shameless giveaway by the other. The one-page “Framework on Immigration Reform and Border Security” released late Thursday would double the number of immigrants eligible for deferred deportation, to about 1.8 million people nationally and 50,000 in Arizona, according to Migration Policy Institute estimates. It would also create a 10- to 12-year pathway to citizenship for those people. But the plan also calls for $25 billion for a border wall, more money for immigration officers and prosecutors, an end to the visa lottery system and a sharp reduction in the family migration system – derided by critics as “chain migration” – to limit its use to minor children and spouses. 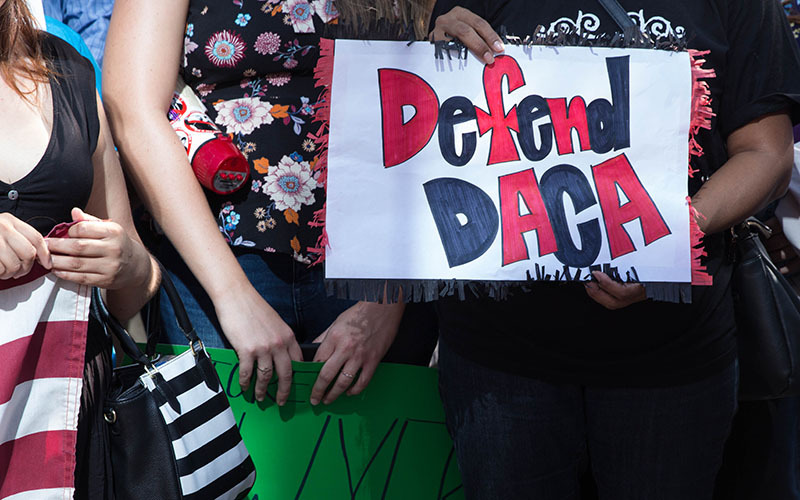 Even though it could eventually provide citizenship – which has been a deal-breaker for many conservatives – to twice as many people as those now covered by the Deferred Action for Childhood Arrivals program, immigration advocates were outraged by most of the elements in the plan. And some were not even sure they could trust the proposed DACA numbers put forward by President Donald Trump’s administration. Advocates derided the enforcement portions of the plan as “white supremacist ransom note” and a “nativist wish list” from elements within the Trump White House. “There is no green card shiny enough to justify the consequences” of the framework, said Jonathan Jayes-Green, a DACA recipient and co-founder of the UndocuBlack Network, during a conference call by advocates Friday. “The White House immigration framework offers Americans too little while granting illegal aliens too much to be considered a principled, credible approach to curtailing illegal immigration,” said a statement from the organization, which pushes for tougher immigration enforcement. “By any definition, these numbers expose this framework as a massive amnesty vehicle, not a reasonable DACA compromise,” FAIR said. A lack of compromise over immigration led to the partial shutdown of the federal government last weekend, when Senate Democrats refused to approve a federal budget extension until they got a promise to get a vote on a fix for DACA, which expires March 5. There were at least a dozen House and Senate plans in the works before the White House announced its framework this week. While it is short on details, there were enough to get both sides worked up. Trump announced on Sept. 5 that he would end DACA, the Obama-era program that protects illegal immigrants if they were brought to this country as children. But where that 2012 program covered about 800,000 people, the Trump plan unveiled this week would increase the eligible population to 1.8 million people. Most of the single-page framework focuses on increased funding for border security and the closing of “legal loopholes” to expedite deportation of illegal immigrants. The plan also restricts family migration by limiting family sponsorship to spouses and minor children for both citizens and legal permanent residents, and calls for elimination of the visa lottery program, which it said is “riddled with fraud and abuse,” in favor of a visa system targeted at skilled workers. Advocates defended those two programs Friday, saying they have been the best way for poor, unskilled immigrants to legally enter the U.S. from countries that the president reportedly derided with a vulgar name in a meeting with lawmakers. Advocates balked even at the parts of the plan that would benefit them. “I don’t think it’s going to encompass the 1.8 million,” said Madhuri Grewal, federal immigration policy counsel for the American Civil Liberties Union. She fears that what she called “coded language” of the framework could open the door to the Department of Homeland Security “arbitrarily revoking” immgrants’ status. Advocates said Trump created this immigration crisis with his decision to end DACA and accused him of trying to exploit it to get the tougher immigration policies he campaigned on.